ATLANTA, Ga., Apr 02, 2019 (SEND2PRESS NEWSWIRE) -- "THE UNIVERSAL GRAIN. Game of Professionals. Society. The Last Chance" to be held on May 11, 2019 beginning at 10 a.m. ET, ALLATRA International announced today. This momentous event will be held at Georgia Aquarium, in the Oceans Ballroom in the city of Atlanta, Georgia, USA. "We are all people, and we all have one place of residence - the Earth, one nation - humanity, one value - life, thanks to which we can adequately realize ourselves and the meaning of our existence in a higher spiritual and moral aspect. Unification of People is the Key to Survival of Mankind!" -- Excerpt from the report "On the Problems and Consequences of Global Climate Change on Earth. Effective Ways to Solve These Problems." 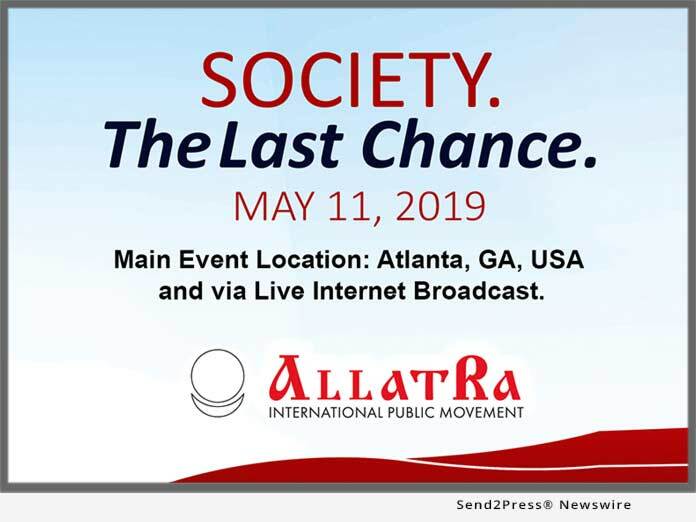 ALLATRA International Public Movement is a format of interaction outside of politics and religion. This global Movement, already joined by millions of people from over 140 countries, is open to all people of good will regardless of their place of residence, nationality, social status, religion or political affiliation. The activities of this volunteer, all people's movement, are aimed at reviving spiritual and moral values in the world community and establishing a peaceful dialogue around cultural, social, spiritual and moral conditions of life within society.